Trumpeter Maynard Ferguson was born on May 4, 1928 in Verdun, Quebec, Canada and died on August 23, 2006 in Ventura, California. Ferguson’s parents were both musicians, and the boy was playing both piano and violin by the time he was four years old. He switched to coronet at age 9, and at 13 he did his first solo with the Canadian Broadcasting Corporation orchestra. As reported by Feather & Gitler in “The Biographical Encyclopedia Of Jazz,” Ferguson studied at the French Conservatory of Music in Montreal and then went on to play with Boyd Raeburn, Slide Hampton, Jimmy Dorsey, Joe Zawinul, Charlie Barnett, Jaki Bayard, and a great many others. Die-hard jazz purists often expressed dismay at what they referred to as “the commerciality” of some of his work. And it is true that he at times seemed to pander to the lowest common denominator. However, the fact remains that he was one of the greatest jazz trumpeters ever. If he now and then chose to record an album for the potential monetary benefit rather than for the artistic contribution, so be it. Artistic integrity is important, but a man’s first priority has to be putting food on the table for his family. Ferguson continued to tour and make records pretty much continuously through the first few years of the 21st century until his dead in 2006. 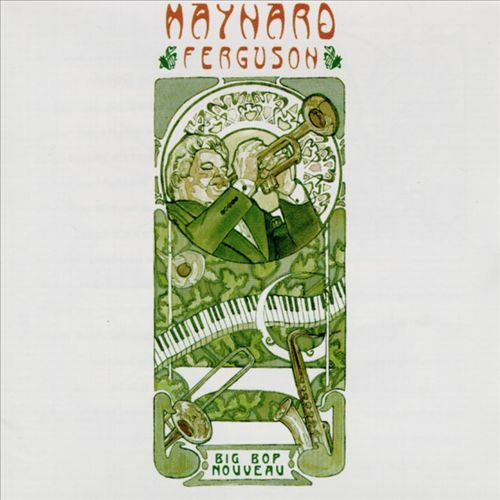 The Maynard Ferguson album I want to tell you about today is 1990’s “Big Bop Nouveau.” This also was the name of his extremely popular final band. With a group of this size, I will not be bothering to guess which of the many brass players is taking the lead at any one time. The liner notes that came with the CD do mention “featured players” for some songs, and I will pass along that info. “Big Bop Nouveau” opens with “Blue Birdland” from the under-appreciated multi-instrumentalist and composer Jimmy Giuffre. This piece of music is a barnburner that manages to set the pace for everything that follows magnificently. Individual performers to listen for are Hollyday on alto sax, Kostur on baritone sax, Bevan on guitar, and of course our host, Maynard Ferguson, on trumpet. Ray Noble’s “Cherokee” is next. This one takes off flying almost from the first note and does not let up. Hollyday and his alto sax sail through this with barely a letup. At this point I am tempted to add a dramatic bit of flourish and say the rest of the band had to struggle to keep up, but that’s a bit of hyperbole that this doesn’t need. Hollyday literally flies through the song, and the rest of the guys follow like the proverbial bats out of that non-existent hot place all the way to the end. Up next is “Caught In The Current” from bandleader and composer Gene Stone. The word “current” as used in the title might easily refer to either electrical current or current of water. If you’re caught in an electrical current, you can’t let go of it; if you’re caught in a current of water, it won’t let go of you. Either way, you are hopelessly trapped. Thus it is with the song “Caught In The Current,” which you won’t want to let go even if you could. Be prepared for the fastest four and a half minutes you are likely to spend any time soon! Ferguson on trumpet and Wallace on tenor sax are standouts, while bassist Donica and drummer Tull drive the melody forward relentlessly. I’m going to skip ahead to “Cruisin’ For A Bluesin’,” which was written by a fellow who is nearly anonymous on the web, Andy Wiener. This is a big song, both big in sound and in length. At just under eight minutes, it’s the second-longest song on the album. The horns here are mostly trumpet, and from the liner notes it appears that Ferguson overdubbed them all himself. I’m not sure why he would do that when he had four other horn players involved in the project already, but hey, it’s his album and it was his call. The song rolls along at breakneck speed and before you know it nearly eight minutes has vanished and you are still wanting to hear MORE! So despite that bit of foolishness, I’m fairly certain you will find this medley to be one of the most enjoyable twelve minutes of your life. The opening of “Chameleon” is a clever homage to the theme from the “Rocky” movies. It quickly moves on into the familiar song we all know and some of us love. About two and a half minutes in we segue into the familiar strains of “MacArthur Park,” one of the monster hits Jim Web turned out in the 1970’s. This version comes across as a triumphant celebration, and wisely leaves it to the listener to determine what to celebrate. Slide Hampton’s “Frame For The Blues” comes along at about the four minute mark. Set for the most part in a lower register than “MacArthur,” “Frame” is a celebration itself, albeit one with a quieter intensity. “Frame” gives way to the classic “Maria” about six and a half minutes in. This is another quiet number, with audience applause dubbed in as it was in “Frame.” Ferguson and the group gives it their all in this quintessential song of love at first sight. At about eight and a half minutes in the guys get to the meat of this medley: Joe Zawinul’s “Birdland.” Ferguson was no stranger to Zawinul or his music, as Zawinul had been a member of Ferguson’s band for a time. I have not heard the original as performed by the Zawinul’s legendary band, “Weather Report,” so I can’t compare the two, which I suspect would be like comparing apples and oranges. I can tell you that this version makes for a knockout ending to an album filled with winners! There are dozens of Maynard Ferguson songs on the web, but after looking through page after page of them, I was only able to locate one song from this album. As luck would have it, the one that I did find is the hit medley. I hope you enjoy it! All of that being said, I’m sure it will come as no surprise to you when I say that “Big Bop Nouveau” will make a superb addition to your personal playlist, for a Saturday or any other night! To find out more about Maynard Ferguson and his music, here are some places to start. You can read Scott Yanow’s bio on All Music, and then there is an extensive bio at All About Jazz, and his obit from the NY Times has a lot of interesting information as well. NOTE: I have seen different spelling’s of Glenn Kostur’s first and last names. In fact, in the review of “Big Bop Nouveau” on allmusic.com, they list two different spellings among the credits as though he were two different people. According to his web site, the spelling I am using here is correct. Thanks Al. Pleased to have discovered you here. Lots to investigate. Regards from Thom at the immortal jukebox. Many thanks for the kind words, Thom. Theimmortaljukebox sounds like a place where I would feel at home. I’ll be checking it out.